The CaniX races over the weekend of the 9th & 10th February were held in Lydiard Park, West Swindon, very close to us at K9 Trail Time. The park itself is set around the grounds of a house now used for conferences and is very popular with both dog walkers and runners. The local Parkrun is usually held over part of the CaniX race course but for this weekend the run was cancelled, as the two races would have overlapped. This is the 4th year we have competed here, the first 2, I ran the two dog class with Tegan and Judo, then I ran the pair of them on the scooter last year and so this year I decided to enter the bikejor class with Donnie. The bikejor and scooter class is over a slightly different course to the canicross, as the runners head off the start line on the grass down a slope to a cross a narrow bridge at the bottom. The canicrossers then run through a little wooded area and out beside the lake, before turning left up towards the house and along the walled garden. The track then joins up with the bikejor and scooter course and the rest of the run is on hard packed trails. The start of the bikejor is near the finish chute for both the canicross and bikejor and sets you off across a grassy field (which the runners finish down) before hitting the hard packed track, where with a sharp left hand turn, you arrive on the part where the runners join up with the bikejor and scooter course. The trail then takes you slightly downhill on a wide open track which rides very quickly on the bike or scooter. You have to be careful at the bottom of this downhill however, as there is a little pool on the right which the dogs like to take a dip in if you’re not fully concentrating! The course then takes you slightly uphill around the edge of some fields, with a couple of left turns and then another left back along towards the house. At this point the bikejorers and scooters do another lap on the trails and the canicrossers turn right across the field to the finish chute. When the bikejorers reach the left turn towards the house on the second loop, the course continues straight on and down to the finish along the edge of another field. On both days the weather was not kind to us and the rain was lashing down as we raced. The canicrossers had a tougher time, with their start being on a muddy downhill, compared to ours on the bike which was across a field and slightly uphill. Donnie and I had a great run both days and in spite of a few dog walkers with loose dogs (again) we got quick times, giving us an overall 3rd position for the two days racing. 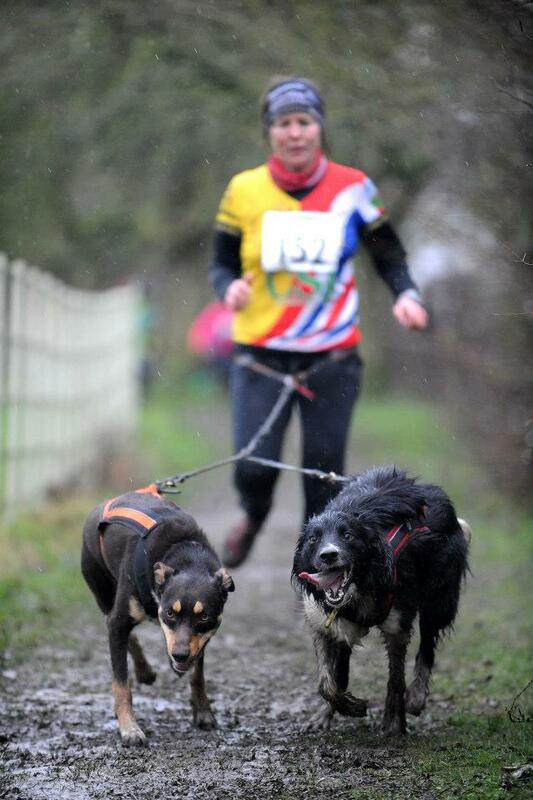 The Lydiard CaniX course is another one that (aside from the downhill muddy start for the canicrossers) I would classify as a good starter race for anyone wishing to try canicross, bikejor or scooter racing for the first time. Canicross and bikejoring in the UK are relatively new sports and they have been filtering in through the mushing world, where sled dog sports have recognised them for a number of years. The popularity of the sports have grown because people have realised that to participate, you don’t need to have a team of huskies and most family dogs enjoy accompanying their owner for a jog or a bike ride. 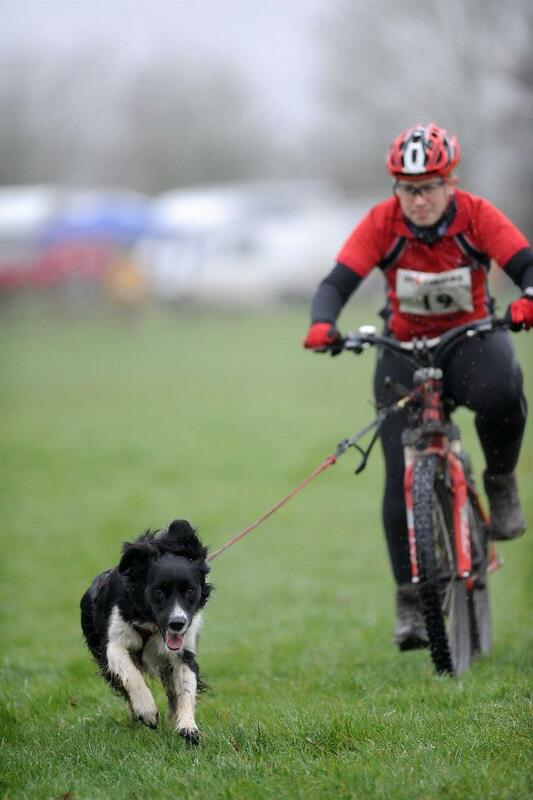 The recent development of the sports has meant that many people involved have a background in either dogs or running/biking, but few can claim to have vast amounts of knowledge in both combined, as the disciplines are ‘new’ in the grand scheme of mans’ working relationship with dogs. However, my point in writing this is not to criticise anyone, but to demonstrate how with an open mind – people with the experience of both dogs and running/biking, can combine their knowledge and help to secure the future of these sports in the UK. 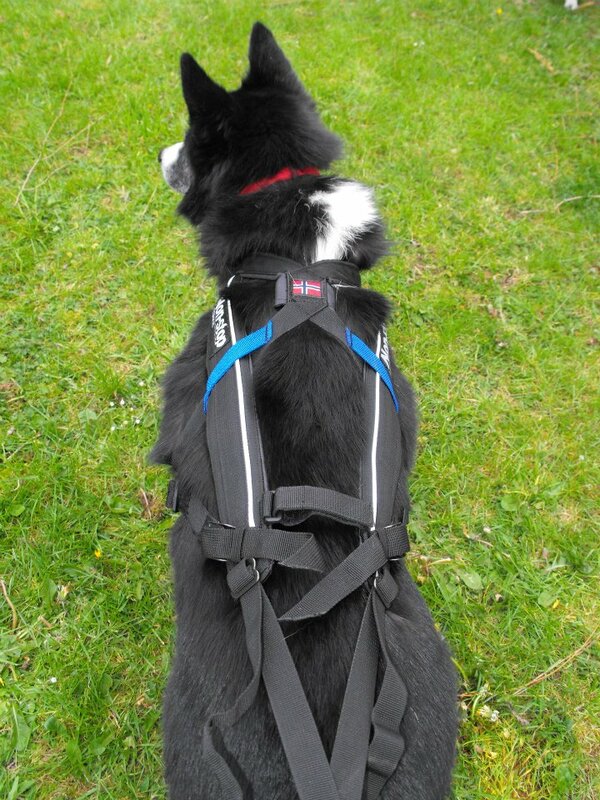 For example, until recently, the manufacture of the harnesses used for canicross and bikejor has predominantly been in the USA where the x-back harness has been tried and tested in many long distance sled races. The Europeans have been busy, not only producing different style harnesses to suit dogs of a different breed and shape to the sled dog but also specifically for the sports of canicross and bikejor, as Europe is where the sports have seen their biggest growth in popularity. There are also dogs in Europe which have been bred specifically for these sports known as ‘Euro hounds’ and they too are a product of the increase in interest in canicross and bikejor. I personally have been involved recently in promoting bikejor and our races have taken us to places where mountain bikers use the trails regularly and have been in awe of us attaching our dogs up front for the extra adrenalin rush. The mountain bikers have been full of questions about the sport but I had lots of questions for them too. 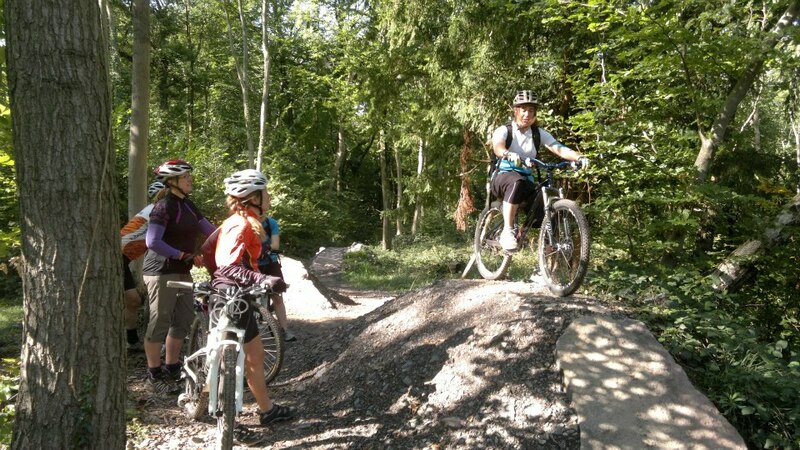 Not having had much experience on a bike, I even went for a half day training course with one of the UK’s top female downhill riders because there was so much to be learned from the perspective of the bike rider. The same applies to running, as there are running clubs set up all over the country for all levels of experience, to allow people to learn from other more ‘seasoned’ athletes and to train with people who will encourage each other to improve. 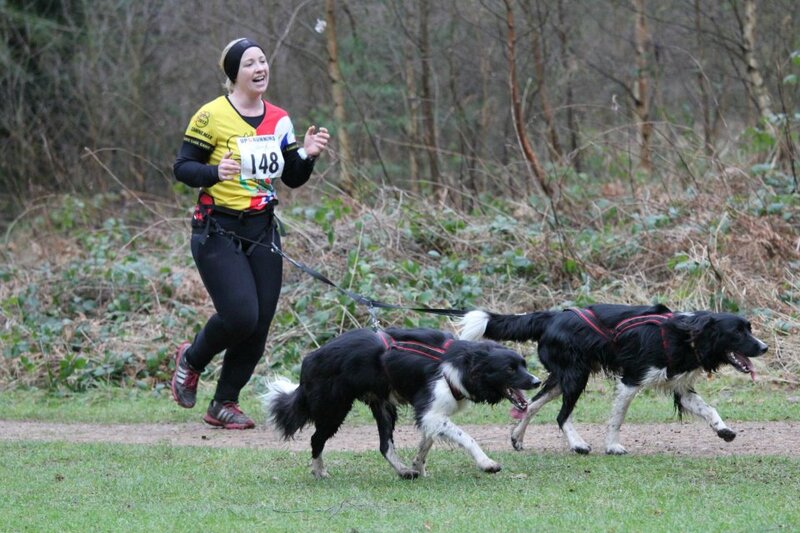 The discipline of canicross can learn a lot from club runners and I think there is a future for organised training canicross runs to help encourage new people into the sport. In essence if you are a runner – you can canicross and if you ride a mountain bike – you can bikejor, it just takes a bit of adaption to move from being a single body to a ‘team’ where you not only have to think about what you are doing but have the added of complication of a dog or dogs who also think for themselves and might not make the same choices you would on a cross country course. 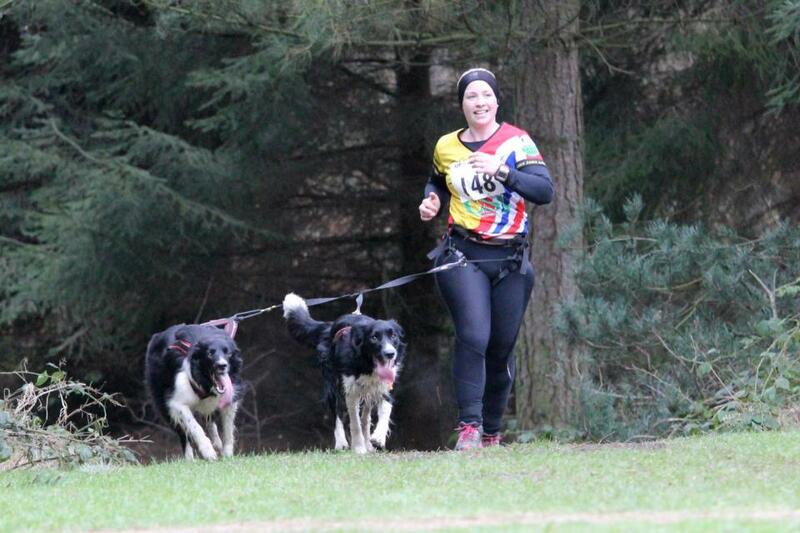 I think we can learn as much for the sports of canicross and bikejor from people who have been involved in running or biking clubs, as we can from people who have been involved in other dogs sports such as agility and dryland mushing and don’t think we should dismiss any knowledge at this stage of the sports’ development. Input should be welcomed from all fields of expertise and I believe with the combining of this knowledge and promotion of our sports, they cannot fail to grow in popularity as people realise they can involve their dog in their favourite activities too. The CaniX races at Sherwood Pines were held on the 2nd and 3rd February at the fantastic venue of Sherwood Forest, situated just North of Nottingham and near the town of Mansfield. The car park for competitors and the general public was found at the top of a large open field that led down the start of the racing. I was pleasantly surprised to see no mud again and although the tracks went off into the depths of the trees, most of the course was on either hard packed, or sandy trails which made for fast running times. The course was also relatively flat with only a few undulating sections and no hills of any real note. It was for this reason I decided to run the two boys, as with no steep descents and no slippery mud to contend with, I thought I would be safe! The competitors all shot out of the start chute into the only technical bit through some trees, before turning left out onto another trail and further into the forest. Everyone who passed me or I passed, seemed to be enjoying the chance to really stride out in the race on dry ground, as so many courses over the autumn season have had thick mud to negotiate. A right turn on the track, then another, took us onto a long, wide, sandy track in a shallow valley where the noise of the dogs running and racers encouraging them, was swallowed up by the woods all around. I think this was my favourite part of the course, as although it was slightly harder going on the sand, it was nice for the dogs and they really enjoyed this section. After a slight incline and a right turn onto the hard packed trail again, we were flying (sort of!) down a hill heading back towards the start. The forest opened up to the left a little and then we turned right into the trees again for the final run into the finish, with a left turn taking you the last 20 metres and over the line. We really enjoyed both our days racing at Sherwood Pines and although there were a lot of people around, either walking or on bikes, I personally didn’t bump into anyone and the people we saw at a distance were interested and encouraging. I clocked the course as 2.83 miles and so it was a fraction under the 5km. In conclusion I think the Sherwood races were great for the competitive athlete and beginner alike, because the course was flat and fast allowing great times and an enjoyable run for all.